You know what I can’t stand? People who say “Oh, I never follow a recipe. I just put things in a pan and somehow it all comes together.” Oh yeah? I’d like to see how your souffles come out. Go on, show me how to bone a duck. 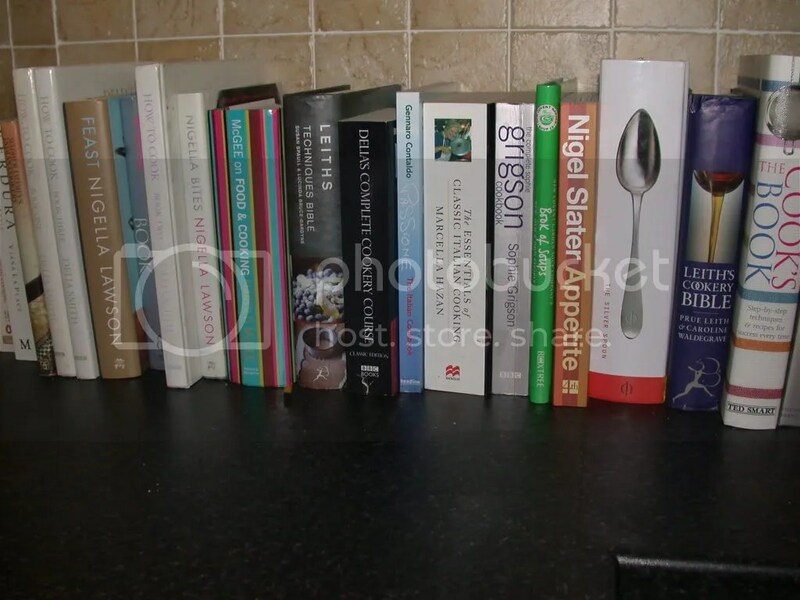 I love my cookbooks. I read them in bed. I don’t always follow them religiously and there are at least three in the above line-up that I have never actually cooked anything from. But who cares? Half the joy of food is in the thinking of it and in reading about it. I hate being made to feel bad for not being spontaneous. There’s a reason why recipes exist and it’s to HELP US COOK WELL. I’m willing to subjugate my idea of what might be a really great twist on a meal to the principal of always following a recipe for the first time you make a food. You can always try it with the twist later, but if you don’t know what you’re doing then for god’s sake listen to someone who does. Occasionally I try to start notebooks (lovely, moleskin ones, from those shops with the froo-froo presents) all neatly with lists and ideas for recipes from cookbooks that I’d like to cook. But then they get messy and out of date and I get cross with them. I just can’t do it. And that’s why I’ll always love my cookbooks.